Fairy Lights adds decorative hanging lights that can have any combination of six light variants each with one of the sixteen dye colors. In order to craft hanging lights you first must craft the lights. Lights come in six standard variants, fairy light, paper lantern, orb lantern, flower light, ornate lantern, and oil lantern. There are also 4 spooky lights, spider light, ghost light, jack o'lantern, skull light, witch light, snowflake light, icicle light, and meteor light. Fairy lights are crafted by a horizontal combination of iron ingot, string or stick, iron ingot, along with any combination of lights to specify a pattern (left-right, top-down). 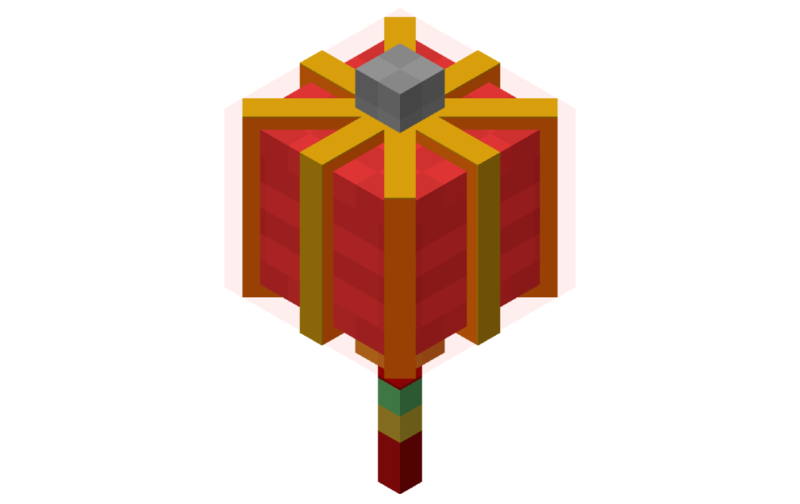 If glowstone is included the hanging lights will twinkle. If string is used there will be slack in the connection and if a stick is used the connection will be straight. 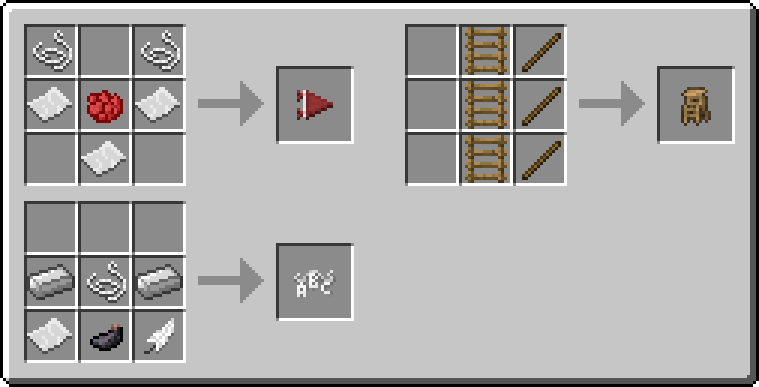 The hanging lights item will only show the first four light colors, but the most lights that can be crafted is eight by placing a hanging lights in a crafting table with eight lights. 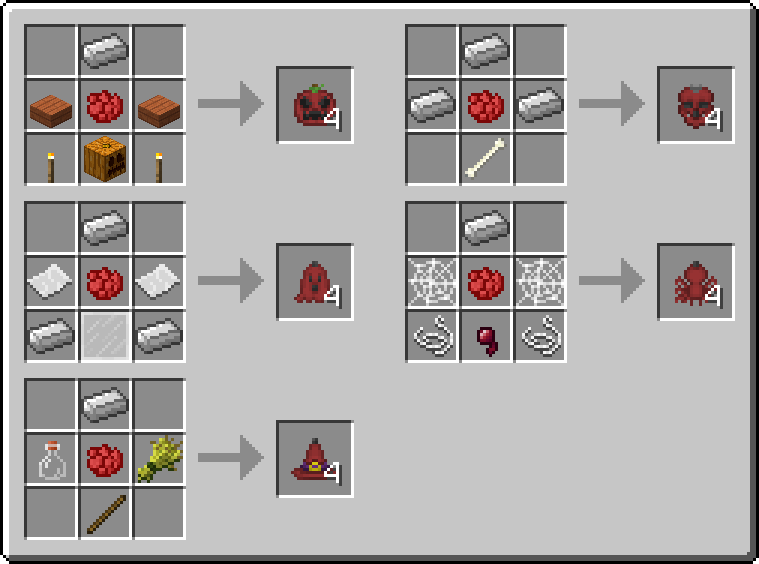 Here are the light recipes where the red dye in the recipes can be any dye. Pennant bunting is made by first crafting pennants that can be any dye color. Here are some example pennant bunting recipes. Right click the hanging lights, garland, or bunting on the side of a block, or an existing fastener to place a fastener, now there will be a connection from the fastener to you. From then you right click on another side of a block, or an existing fastener, to complete the connection. The maximum length of a fairy light strand is 32 blocks. The slack of hanging lights, garland, or bunting can be increased by right clicking it with string and decreased by right clicking with a stick. Hanging lights can be turned on and off by right clicking. JEI is supported for displaying recipes. First time using the mod, and it's great so far! I am having this same issue however. Hopefully someone can help. So I made blue witch hat light strand, and tried to attach it between two 2-high fence poles. It shows via a black outline (just from hovering crosshair over it) that it's there, and says via tooltip "fastener". I right-click the other pole about 5 squares away and attach, and I can see the black outline of the strands that should be there, but it's not. It's all invisible, I only know it's technically there via tooltip on mouse hover over the areas. What could be causing this? I'm using this in the All The Mods 3 pack, v.5.11.1. Please halp? For some reason I just can't place any of the lights at all. Doesn't matter how I get the lights, where I try to place them, or what gamemode I'm in, they just don't place when I right click. Am I doing something wrong? Edit; I discovered that I can place the letter bunting without issue, but the rest of items are still being problematic. eDIT; I'm just daft, ignore my post. 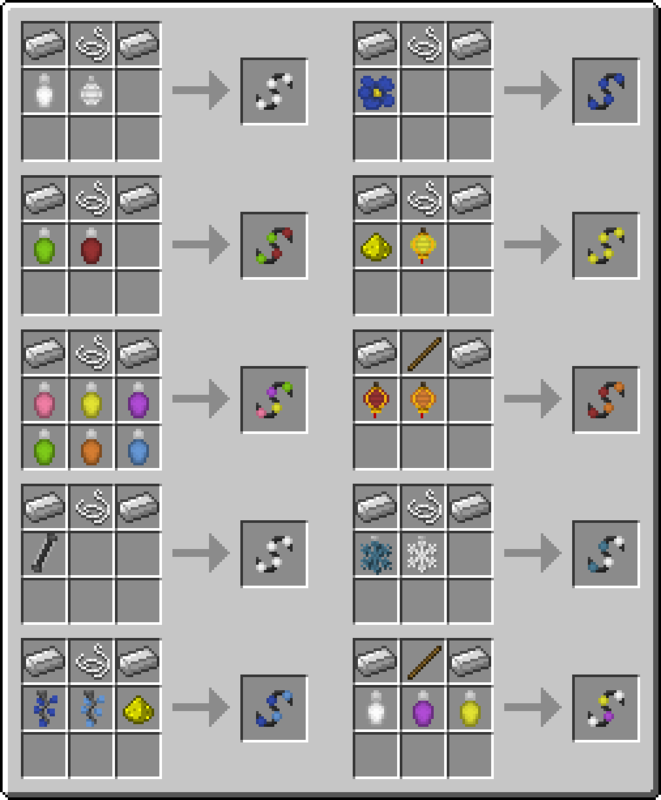 You have to implicate them into the crafting recipe-type thing shown in the "Example Hanging Lights recipe" graphic. Hope that helps. If requests are taken, could i request fish shaped lights? 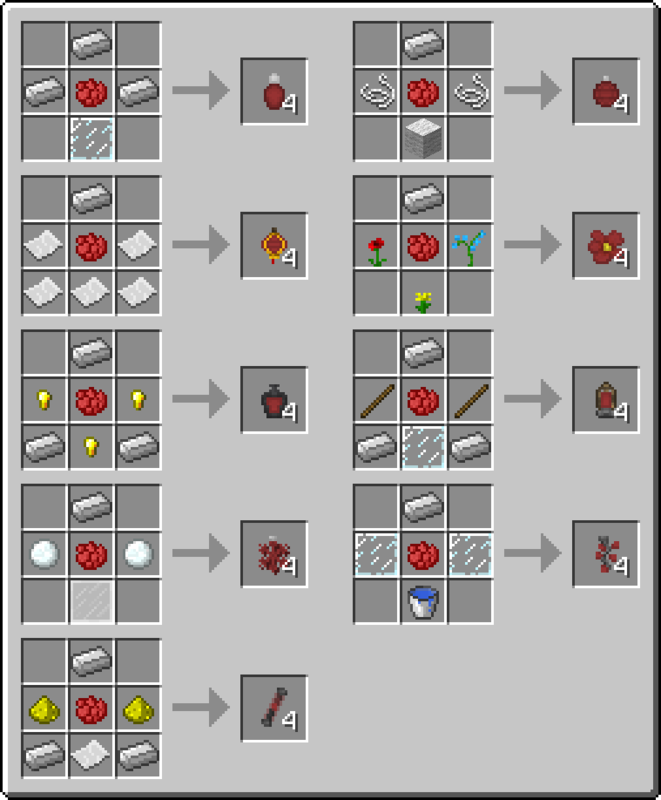 Is there any chance for Fairy Lights that interact with redstone to be added? Edit: Resolved! Thanks for the wonderful mod. For some reason when placing a 2 or 3 block string of lights, they won't light up. Then once you get to 4 blocks long (3 lights), the same lights will emit light. This is a current technical limitation, however I do plan on rectifying this. It will be cool if i can place only one lantern without string. It appears this is an issue related to a more recent OptiFine version. You can use version D3 until I release a new Fairy Lights version to be compatible. I've just released 2.1.4-1.12.2 to fix this issue.